Heat the oil in a large pan. Add the onion and cook gently for 5 minutes. Stir in the celery and cook for a further 3 minutes. Add the tomatoes and the chicken stock. Bring to the boil and simmer (covered) for 25 minutes. Heat the oil in a large saucepan. Add the onion and cook gently for 5 minutes. Stir in the garlic, ginger and coriander, and continue cooking for 2 minutes. Stir in the carrots and cook for another 3 minutes. Add the stock powder and water. Stir, and bring to the boil. 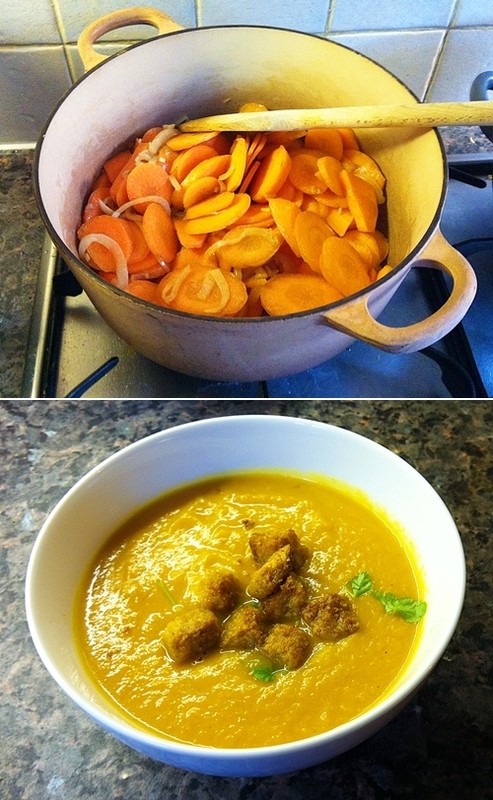 Then simmer for about 30 minutes, or until the carrots are soft. Purée (using a hand blender or a liquidiser). Add the orange juice and black pepper to taste. 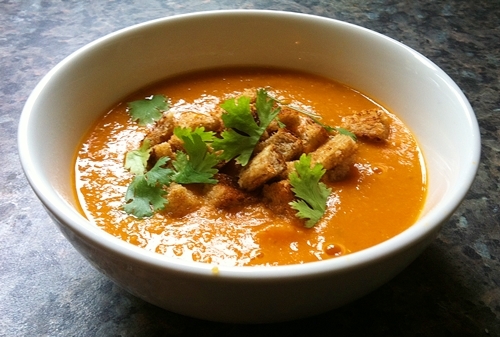 Serve with croutons and fresh coriander. 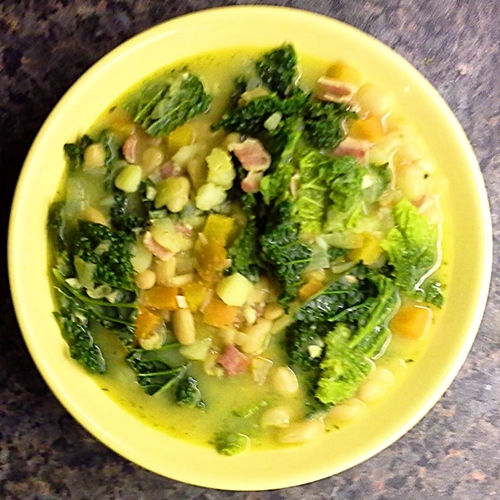 This is a quick hearty soup for supper (enough for 3). Heat a small amount of oil in a large saucepan. Add the diced onion, carrot and celery, and fry gently for about 5 minutes (this is the Italian ‘soffritto‘ which is the basis of many Italian dishes). Add the garlic and fry for another 2 minutes. Add the passata. the hot water, the stock powder and the oregano. Stir and bring to the boil. Simmer for 5 minutes, then add the courgette and continue to simmer. After 5 minutes add the pasta and simmer more rapidly for about 7 minutes. The add the green beans and simmer for another 2 minutes, then add the borlotti beans and simmer for about 2 more minutes. Make sure the pasta is cooked (if not simmer a little longer). Then add black pepper to taste, and serve with grated cheese. 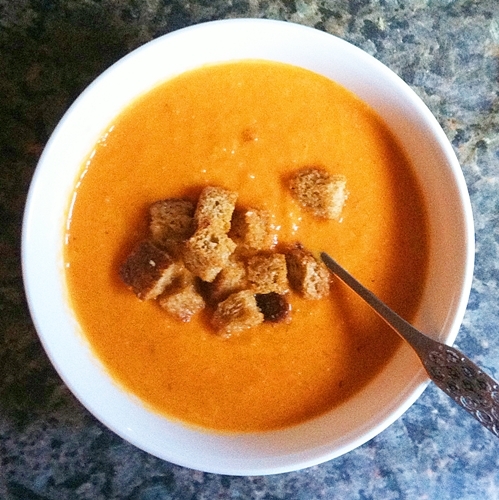 I felt autumn coming on, and the need for a steaming, warming bowl of think tasty soup. 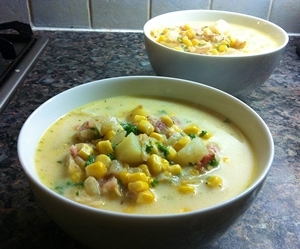 As I had a smoked haddock fillet in the freezer and some streaky bacon about to go out of date, I decided to cook smoked haddock chowder. Heat a small amount of oil in a large saucepan. Add the chopped onion, stir and decrease the heat so that it cooks gently for about five minutes. Turn up the heat, add the chopped bacon and stir fry for about two minutes. Add the cubed potatoes and stir for a further minute. Add the water and crumble in the stock cube (or the vegi stock powder). Bring to the boil and then simmer for about 10 minutes. Add the fish (skin and all – this will add flavour and can be removed once the fish has cooked) and continue cooking for about five minutes (by this time the flakes of fish should be separating and you can remove the skin). If using frozen fish add to the soup about five minutes earlier so that it cooks for 10 minutes. Add the sweetcorn and bring the soup back to the boil. Add the cream, stir and gently heat until it just boils. Switch off the heat, stir in the lemon juice (how much depends on taste), the black pepper and the parsley. Serve. Heat the oil in a large saucepan. Lower the heat and add the onion, stirring occasionally for about 3 minutes. Stir in the cummin and cook for a further two minutes. Then add the red pepper and the sweet potato. Cook for a further five minutes, then add the water and the stock powder. Bring to the boil and then simmer for about 30 minutes. Serve with croutons (two slices of wholemeal bread cubed, mixed with 2 tbsp of oil, grilled on a baking sheet, turning over occasionally).